My local zoo was the delightful recipient of two orphaned Kodiak bears from Alaska, and they are thriving in their new environment. They are so fun to watch! These two little guys from Wplus9's Curious Forest Friends stole my heart and I had to have this set to create with! 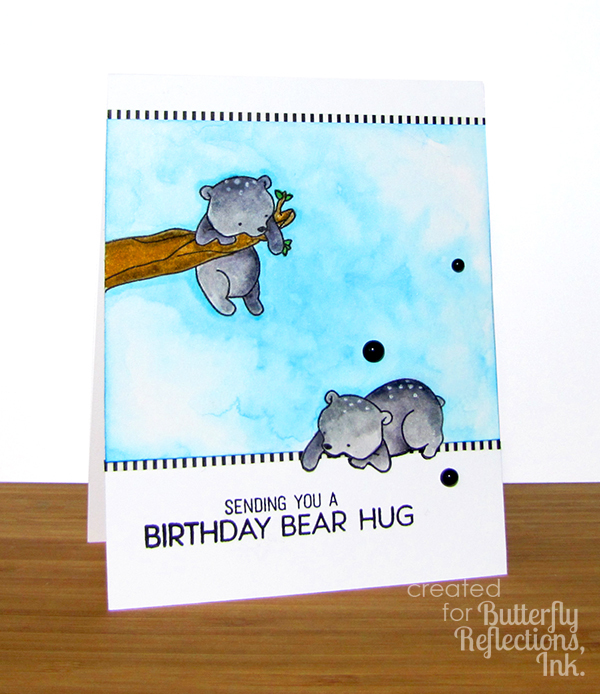 If you are in love with cute critters, this stamp set is for you too! Karen B. from The Bald Dragonfly here showcasing a clean and simple creation. 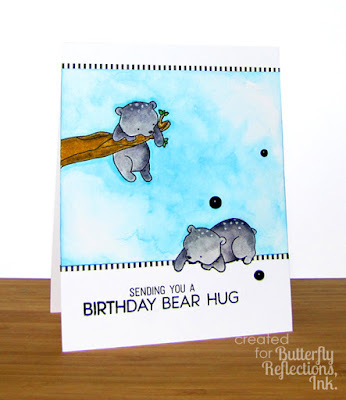 I started by stamping and then masking the two cute bears from Curious Forest Friends and then watercoloring a light sky background with Salty Ocean Distress Ink and Zig Markers. I removed the masks and colored the leaves and bears with Zig Markerss, adding a few details with the Uniball Signo White Pen. I trimmed the panel, being careful to cut around the legs and belly of the bottom bear. 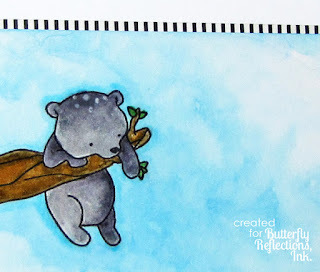 Before adding the panel to a white card base that had been stamped with My Favorite Thing's Forest Friends, I added two bordering strips from this really cool and thin Black and White Stripes Washi Tape (the price on this can't be beat!). I finished the card with a few enamel accents created with Nuvo Crystal Drops Ebony Black. These guys are so adorable- and your creativity never ceases to amaze me!! Fantastic, Karen!